DVD video is blamed for some restrictions and playing DVD can be a little triky. On the one hand, DVD requires a DVD drive and a MPEG2 decoder; on the other hand, each disc contains one or more region codes, restricting DVD player from playing the disc that doesn't contain its region code. For example, a DVD player in region 1 won't play DVD bought in region 2 or 3. This is especially annoying when you want to play a DVD you bought in another country. Worse still, the hundreds of thousands of DVDs spanning years of collections is really space occupation and cumbersome, which are especially hard to carry along when you are on a flight. This propels the provenance of digitizing DVDs into a format that makes DVDs easy to store and play. MOV is convinced to be the most suitable format to rip DVD to on Mac as MOV is the default QuickTime format. The video format functions as a multimedia container file that contains one or more tracks, each of which stores a particular type of data: audio, video, effects, or text (e.g. for subtitles). MOV is developed by Apple Inc., and is the optimal choice in Apple ecosystem. It can be played on iPad, iPhone, QuickTime player and Apple TV, iTunes, etc and has a smaller capacity, with good image and sound quality. So tons of people are looking for methods to convert DVD to MOV format for playback on iPad, iPod, iPhone, QuickTime player and so forth. The conversion task can be done with a free DVD ripper like Handbrake. But most often, you will run into troubles like software crash or stuck during ripping. This is because many DVD-video titles use Content Scramble System (CSS) encryption, intended to stop people from ripping DVD against piracy. Additional anti-ripping measures including Sony ARccOS, X-project, Anaho, and others also emerge as an attempt to cause problem in DVD copy software when ripping protected DVD on Mac. Among these tools, MacX DVD Ripper Pro brings the ultimate solution to convert DVD to MOV on Mac and Windows, which now supports all the intractable DVD discs, thanks to the unique DVD analysis engine and title check mechanism. This means you can not only rip general CSS encoded DVDs, but also rip Disney DVD or other new DVDs published by Sony, Warner Bros., Paramount, etc (such as Moana, Zootopia, War for the Planet of the Apes, Spider-Man: Homecoming, etc), with no problems. It is also known as a fast and easy-to-use DVD ripper for Mac, ripping DVD to QuickTime player MOV format with great quality and super fast speed, thanks to the high-quality engine, deinterlacing, hyper-threading, multi-core CPU and World's unique Intel QSV hardware acceleration technology. This utility both supports to copy protected DVD on Mac to iOS image, MPEG2, MKV,and convert DVD to MOV, MP4, WMV, AVI, FLV, H264, MPEG4, etc without any limitations of DVD disc. The guide below will show you how easy it is to convert DVD to MOV on Mac. Free download the No.1 fast DVD converter for Mac, Windows version is available as well. Click "DVD Disc" to add DVD from DVD drive. Or you can click "DVD path" to import DVD from DVD folder saved on your computer. Select the output format as you want, in this guide, we choose "to MOV" for example. Specify an output folder on your computer to save the output files. Click "Browse" button to choose the path where you want to save the output MOV files in. After finish the above steps, click "RUN" to start to convert DVD on Mac. You can view the conversion progress and are able to cancel the converting process at anytime. Note: MacX DVD Ripper Pro constantly upgrades to support new movies on DVD. Thus you would not miss any movies published by Disney, Paramount, Warner, etc. Besides, It allows you to convert DVD to MP4, FLV, MPEG, AVI, iPad 2, iPad, iPod, iPhone, etc with high video/audio quality. The New-DVD-Backup feature let you copy DVD to hard drive of single video file with original video quality and 5.1-channles AC3/DTS Dolby audio. As is known to us all, MOV is the default format for QuickTime Media Player. If you are willing to play MOV on Mac, just open it with the built-in QuickTime Player for playback. While, for Windows users, Windows Media Player (WMP) is much more familar. But the WMP doesn't support the MOV file format unless they've updated their computer system to Windows 7. Still, it's not absolute. So here I suggest Windows version QuickTime for MOV files playback on Windows platform. Or else, some other media players like VLC, 5KPlayer are also available to play MOV files both on Mac and Windows computers. Well, there are more times to play MOV movies on mobile devices on the go. Based on this fact, you can take advantage of MacX MediaTrans to transfer the DVD-converted MOV files from computer to iPhone iPad. Thanks to the built-in auto video conversion, the iPhone video transfer can convert MOV, AVI, ISO, WebM, FLV etc. to iPhone video format during the transferring process. Go ahead to connect your iPhone to Mac with a USB cable > Click "Video" > "Add Video" to import MOV files > "Sync" to transfer MOV from Mac to iPhone. The step by step tutorial is going to show you how to convert DVD to MOV format on Mac for playback on QuickTime player by using free Mac DVD to MOV Ripper. 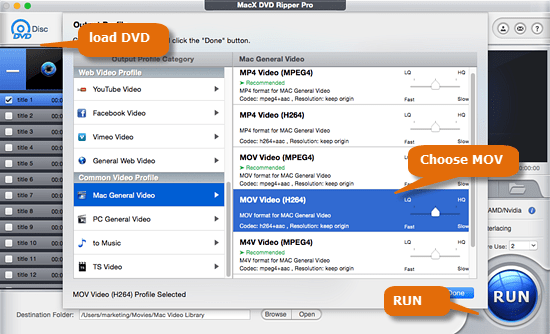 MacX DVD Ripper Pro is the best DVD converter to convert DVD to MOV and lots of digital formats on your Mac. It's a handy thing to have when you're trying to back up your DVD collection.